My story starts when my hubby came back from his 3 year stint at a Software Company in USA. We bought a new apartment in Mumbai city, a brand new car and decided to settle down in India. That was when we seriously started thinking about having a baby. I had been wanting to get pregnant for years, but it was never the right time for him. One day he said, "Hey honey, let’s have a baby". I was so surprised and happy to hear that! After a month of trying, I got pregnant. Both of us got excited. Our doctor found the heart beat with no trouble, and said I was a little bigger than expected. She also said that since I was so excited she'd send me for an early ultrasound. Little did we know what she suspected. We went to ultrasound, and after scanning the tech said, "Well the first thing I noticed is that there are two". On the screen we saw 2 little babies kicking each other inside my bump! It was big time shock for us. Twins were not in either of our families, so the thought never entered our minds. But in no time the shock turned to double joy and excitement. Anyway, my whole pregnancy was wonderful! I felt guilty about it because everyone I talked to, had a terrible time. Worst yet, my sister was pregnant at the same time and she was so sick! But I loved every second of it. I felt like we were in the Hospital for scheduled ultrasounds all the time and every time they said, the babies were doing perfect, with no twin to twin trans or any other complication. I ended up getting HUGE, and retained a lot of water, and my blood pressure went up a bit at the end, so they put me in the hospital at about 29 weeks. Other than my back being unbelievably sore at that point and having to pee every 2 minutes, I had no problems. Two days later they put me in a delivery room. My mother and my husband were with me. As the delivery time neared I started getting nervous. I felt like I was loosing my nerve and a sense of fear conquered my mind. Finally when they broke my water, I was in a perpetual dream-like state. My childbirth hormones really kicked in! They asked me to push but it was like they were speaking in a language I didn’t understand. Sadly I don't even remember the babies being born…I was so out of it. Apparently, the hormones to that too…make you forget. Fortunately, we have a video of the birth and it's quite comical! You could hear me in the back ground saying, 'I'm fainting''... 'I'm dying''..."Save me God'' etc, and the best part - when they pulled our little girl out I say 'oooooow'. It's quite funny. My parents and husband still tease me about my behavior on my delivery day. 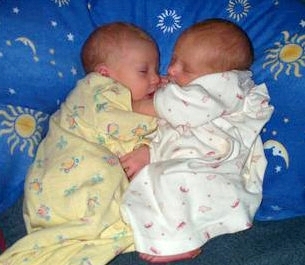 By God's grace, our babies were born totally healthy. Both girls were taken to Intensive Care Unit where they stayed for about 15 hours. When I woke up, the first thing I saw was my husband Sam standing beside me with two beautiful girls in his arms. I was so in love and couldn't wait to hold them. It was surprising for me to hear from him that even though I kind of panicked at the end, I did it all drug free. As soon as we got into recovery Sam handed the girls to me, it was the best feeling I have ever had. The girls are now 2 years old and doing amazingly well.